After 4 days in the party town of Montanita, we were excited to settle down into a nice clean condo for a month in the beach city of Salinas. Unfortunately, it has been gloomy and overcast for 2 weeks now. During the first week, Dusty threw himself at his work. He worked like a champ. A question became relevant that had been asked by our good friend, Jeff. “Wendy what are you going to do with yourself?” At the time, my answer was I was sure I’d find something. I’ll read, go to the beach, go to a cafe, surf the internet or something. Yeah, wasn’t going to happen. It hasn’t been basking on the beach weather yet, there are absolutely no bookstores in the entire city (cause Ecuadorians don’t read, an expat told me), there aren’t any cafes and the internet is so slow on my iPad that I would rather hurl it across the room than wait for a page to load. So, the only thing left was to throw myself into food. I love cooking and have been learning a lot of culinary techniques in the past 6 months. I thought the best thing would be to do more of the same. 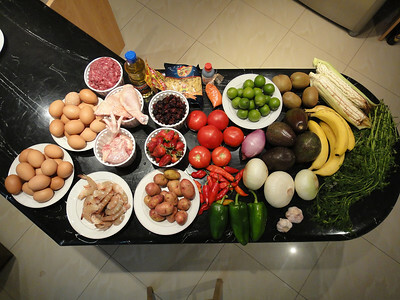 So, Dusty and I headed off to the market to grab some fresh vegetables, meat and seafood. After loading up on a ton of cheap vegetables, we headed over to the poultry section. This is when it got interesting. I stared at this guy for quite awhile contemplating whether I could do the deed. The price sent me over the edge. 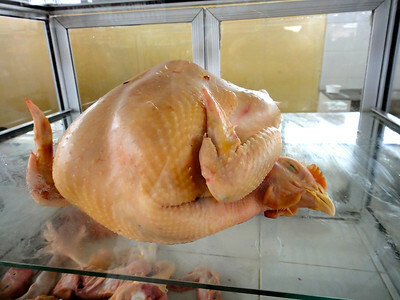 I just could not fathom buying a whole chicken for $8 AND having to cut it’s head off. I literally gagged while trying to imagine it. So, we moseyed on to another stand where we found just half a chicken. Still with the head but with half the body and one foot. This time only $4. Dusty agreed to chop it’s head off if I couldn’t do it. So, we bought it. Luckily, the vendor offered to do the chopping which meant the head went bye bye with one big whack. I was a little pissed that she weighed it with the head on and then discarded it meaning we payed for that head and didn’t bring it home. I didn’t want the head, but still…I payed for it! After grabbing some other necessities, we headed home with a good amount of food for only $30. Many of you ask about how much things cost so here is a run down of the total bill broken down by each vendor. I think you’ll be shocked. Total = $27.30 plus $3 in cab ride. I’d say that’s a deal! The funny thing is I think we got gringo prices. I’m ok with that considering at home you can’t get the avocados we got for $6 and we got them plus blackberries, strawberries, kiwis and bananas! That night I made a delicious chicken noodle soup. Mmmm…and Dusty was very surprised to see that his soup contained a very special ingredient. Whoops! Where’d that come from? We actually had fun taking some nibbles off of it just to see what eating a chicken foot tasted like. It’s a little rubbery, but cooking it in the broth sure made the soup tastier! Hopefully there will be more cooking adventures such as this one in my future. I have yet to cook a lobster and I’d like to try that while I can get them so fresh. Guys stand on the street, dangling them by their tentacles for drivers to pull over and buy. A friend of mine who is a fisherman here said you tear the tentacle off and gut it in the rear with it while it’s still alive. Oohh! I can’t wait! *(me: cackling, wha ah ah!) This post was for Dusty’s sisters. After seeing that head and foot, I will not be surprised if they swear off chicken forever!